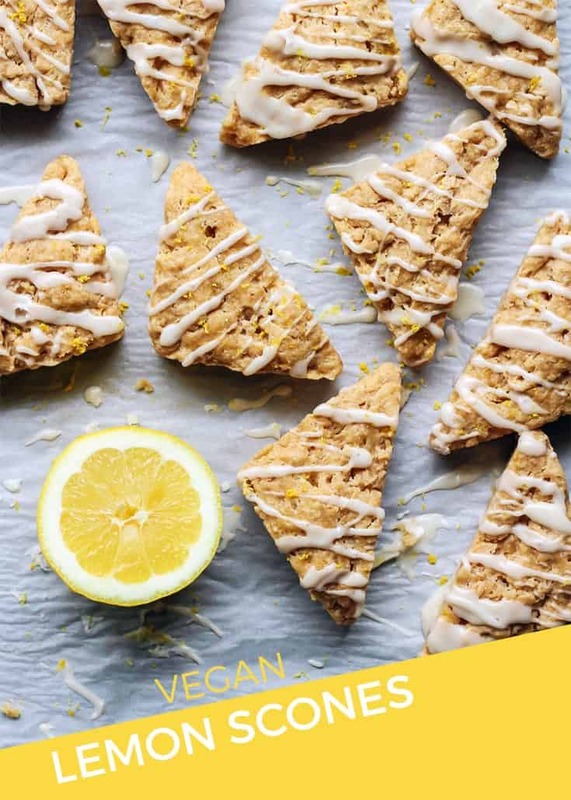 Vegan Lemon Scones made with whole grain flour and coconut oil. These scones would be perfect for your spring brunch. Oh it is THAT time again, my friends >> SCONE TIME. My regular readers saw this coming, yes? I mean, the last scone recipe I shared was back in December. We are way overdue here! 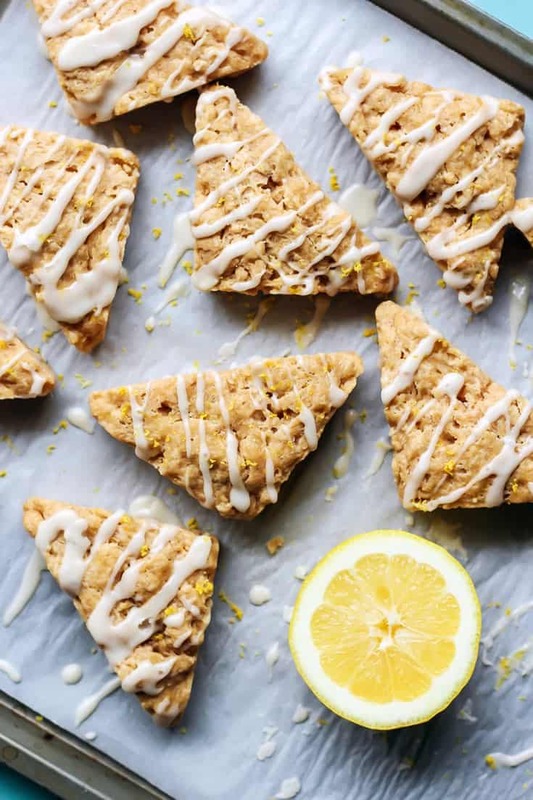 Were you patiently waiting for these lemon scones, AKA Scone of the Season, to be shared? Every time I post a new scone recipe it boggles my mind I don’t already have the recipe here on the blog. Probably because I have a list floating around titled “SCONE RECIPES TO SHARE”… Again, you probably could have guessed that. 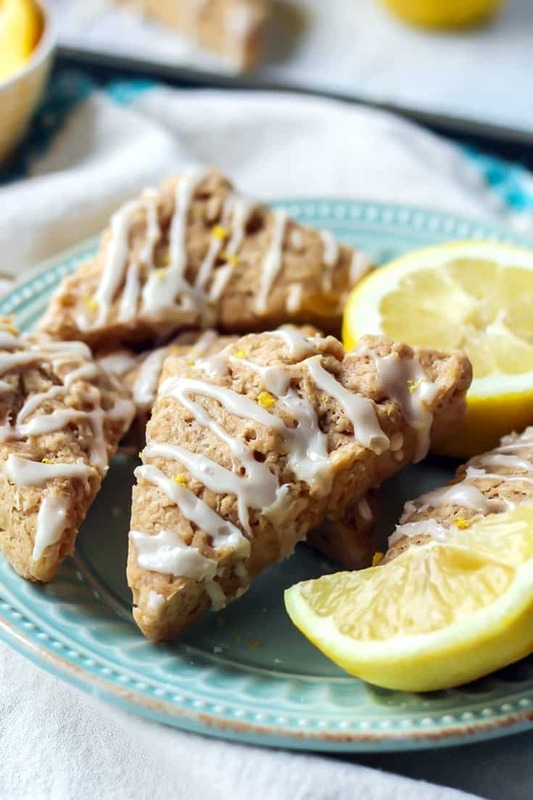 But with citrus season here, lemon scones most definitely had to make an appearance here on Fit Mitten Kitchen. What is so awesome about these scones is they’re actually quite simple. I say this every time but FEAR NOT THE SCONES. Making scones is almost as simple as making muffins. And they can be made by hand in a mixing bowl, OR in your food processor..
Want an extra arm workout today? Make ’em by hand. Already lifted a bunch this week? Use your food processor. Combine dry ingredients. Add frozen oil. Add wet ingredients. Shape dough. Slice. Bake. SIMPLE, right? I also share lots of notes in the recipe page, depending on how you want to shape your scones. I busted out my mini scone pan for this recipe but these scones can be made into a circle as well. Whatever route you choose, they are bound to be delicious. 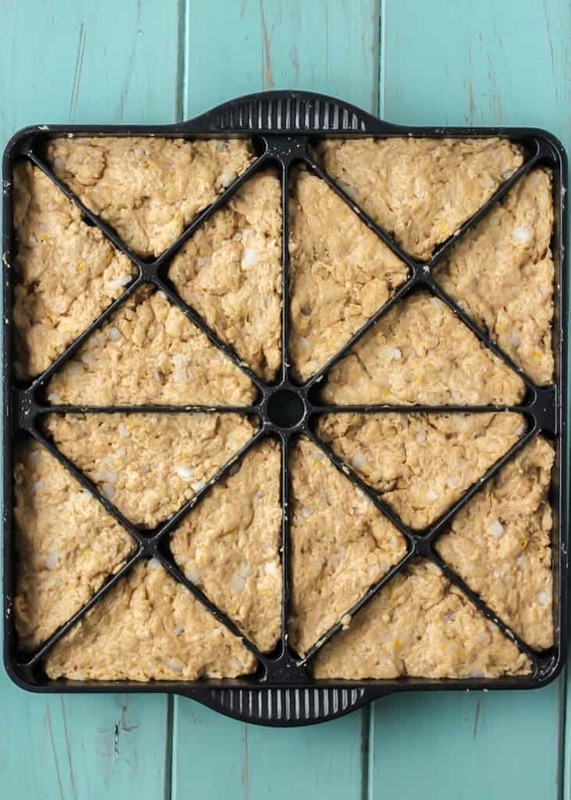 This helps create the crumbly texture you look for (at least I look for…) in a scone. If you use melted coconut oil you’re basically going to come out with a dry muffin. The frozen coconut oil is a little harder to grate (see this post), but that is where if you have a food processor, you can pulse it to pieces with the flour. If not dairy-free/vegan, feel free to use frozen butter. The frozen butter can be grated or cubed and worked in with a dough blender. Feel free to use whole wheat pastry flour OR sub 1 cup all-purpose flour, 1 cup whole wheat flour. You don’t HAVE to use a canned coconut milk, but it does give the scones a richer texture that is the most delightful. But if you don’t have coconut milk on hand, you can sub the milk of your choice. All in all, a delicious scone recipe for this time of year! Preheat oven to 350F and line a large baking sheet with parchment paper, or silicone mat. Set aside. In glass measuring cup, combine the coconut milk with 1/4 cup freshly squeezed lemon juice. Set aside. 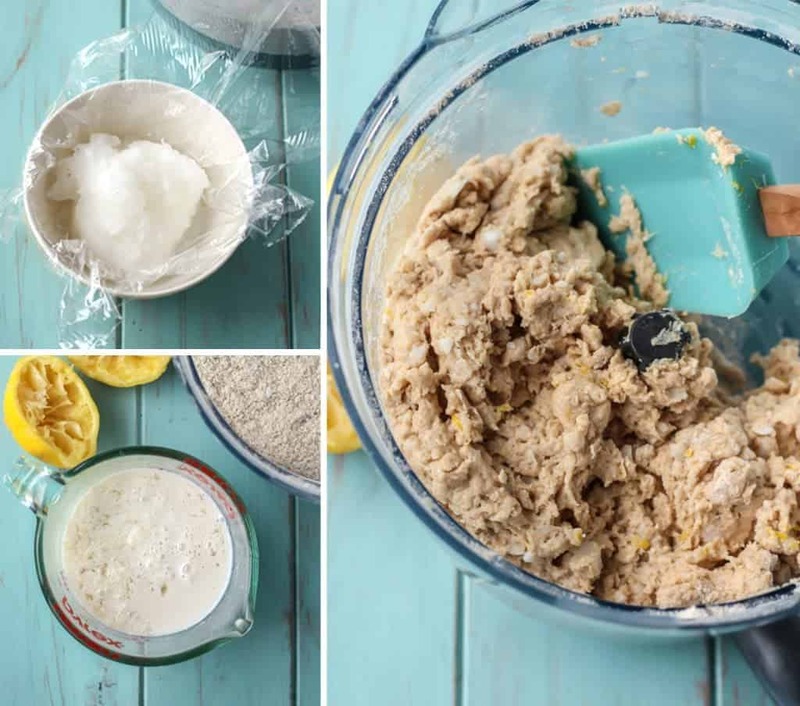 In a large mixing bowl–or bowl of food processor–add flour, sugar, baking powder, salt and lemon zest. Whisk until well combined and set aside–pulse dry ingredients together if using food processor. Gently stir in the coconut milk, and the extracts to bowl of dry ingredients, careful not to over work the dough. Remove S blade if combing in food processor bowl. Bake for 15-17 minutes, then remove from oven to re-cut slices and pull apart triangles slightly. Bake for another 5-7 minutes, until edges and tops are lightly browned. If using scone pan, you may bake the full 15-20 minutes in pan. Let scones cool on baking sheet (or in scone pan) for 5 minutes before transferring to wire rack to cool completely. While the scones cool make the glaze: combine 1/2 cup powdered sugar with 2 TBS lemon juice and lemon zest, if desired. Stir until no lumps are present. With scones on lined baking sheet, or cooling rack with baking sheet placed underneath, zigzag glaze over scones with knife. Allow glaze to set, about five minutes, then enjoy! Scones are best served fresh, but will stay fresh up to 3 days in airtight container. *Canned Coconut Milk: I feel the canned coconut milk gives the scones the best texture, but if you don’t have coconut milk on hand, you can sub the milk of your choice. ***Frozen Coconut oil: This helps create the crumbly texture you look for (at least I look for…) in a scone. If you use melted coconut oil you’re basically going to come out with a dry muffin. The frozen coconut oil is a little harder to grate (see this post), but that is where if you have a food processor, you can pulse it to pieces with the flour. If not dairy-free/vegan, feel free to use frozen butter. The frozen butter can be grated or cubed and worked in with a dough blender. You can also double wrap un-glazed scones with plastic wrap and store in freezer up to 1 month. Thaw at room temperature, toaster oven or in microwave. YES! Can’t wait to try these 🙂 Happy Monday! 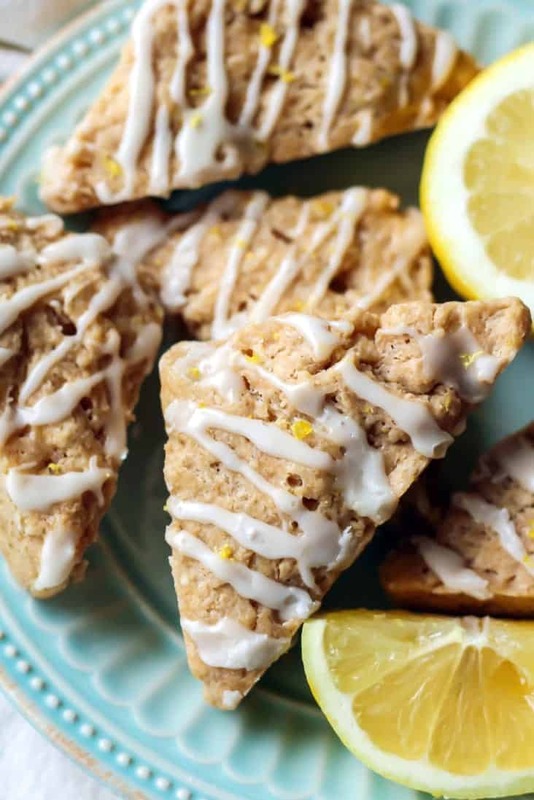 I have yet to try one of your scone recipes (I know – I’m embarrassed to admit that) but these definitely need to be added to the top of the list! How do you make the glaze?? NVM! I totally see it in the instructions now! I edited to add it in the ingredients too 😀 Thank you! YUMMY!!!! My family always always loves Ashley’s scone recipes. I love how you suggested them as an arm workout or to use the food processor, depending on whether you’d already done an arm workout yet this week. These sound fantastic! 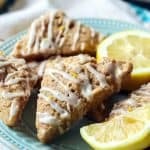 I can never have too many scone recipes so just keep posting :). Happy spring! First thing first— that scone pan?!? I want one SO bad! I absolutely adore scones and definitely want to try your frozen coconut oil version. These sound fantastic! It totally makes the scone process a breeze 😀 Thanks, Liz! The scone pan is totally fun! And I hope you try the coconut milk, it makes them DELICIOUS. Only giving 3 stars because I think the consistency of the dough is slightly off. Mine were more like lightly flavored lemon biscuits. Which is not a bad thing! Still tasted good, but not exactly the scone texture. My dough was definitely off and too liquidy, so I had to add more flour to compensate. I’d suggest reading up on best practices for dough (chunky butter and most importantly COLD dough). I did put my dough in the fridge for about 5 minutes before rolling it out. They took pretty long to cook, 25+ minutes. Worth a try if you want a new recipe to try!